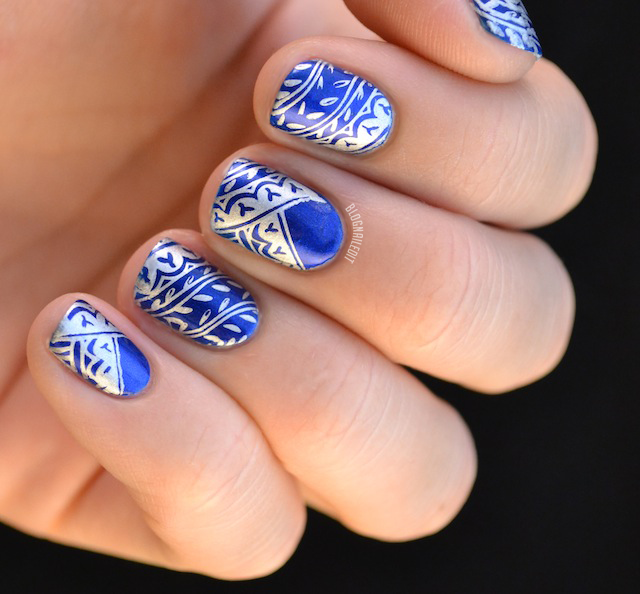 After I stamped these nails, I realized how well the pattern would have gone with the Tadashi Shoji nail art competition. I'm still really glad I did my design freehand though, but this would have been a fantastic stamp alternative. You can still vote for my entry here! I'd love your support! With the winter weather whipping the windows and calling all chills, my nails have been both dry, brittle, and uninspired. Luckily I recently received my plates from Cheeky. If you've been thinking of getting some plates, get these! You can get three jumbo plates, including plate C, which I used in this design, for $19.99 here. Apparently there's also a steal of a deal on a 6-jumbo-plate set for $39.99. Uh...what?! That's unheard of! And these plates honestly rock. The designs are HUGE, and the only thing you'll be complaining about is the fact that your stamper is probably too small for them. Seriously...dang. Don't you love the blue I used? It's Essie's Aruba Blue. The stamp is Silver Sweep (Sally Hansen Insta-Dri). I love this! Such a great color combo and so elegant! Your nails always come out so great. Have you done any videos about how you do your nails? I would love to see you in action and learn some tricks along the way.